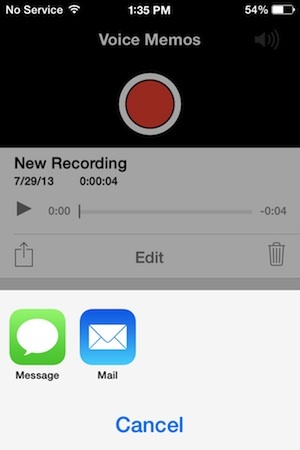 Voice Memos is that ever-useful app that lets you make a quick recording of a voice note, memo, record a conversation, or just generally replace one of those mini-tape recorders that many people use for recording notes while they’re working or driving. While there’s not much wrong with maintaining tons and tons of voice memos on the iPhone, eventually you may want to copy them over to a computer, either for archival and backup purposes, or just to alleviate some of that Other data that can build up over time as more stuff accumulates on the device. Regardless of how many recordings are stored on your iPhone, copying them over to a Mac or PC is actually pretty easy, and we’ll cover two different methods each of which has its own benefits. Yes it really is that simple to send a recorded memo over to yourself. Admittedly, email isn’t the ideal solution, and sending the voice memo to yourself through iMessage may be a better option for Mac users who have Messages configured in OS X. If you don’t have an internet or cellular connection available, the Sharing option won’t do you any good, but you can still copy Voice Memos from any iOS device to any computer using a third party tool, which we’ll cover next. If you have a bunch of voice memos you want copied to the computer, iExplorer is the way to go. 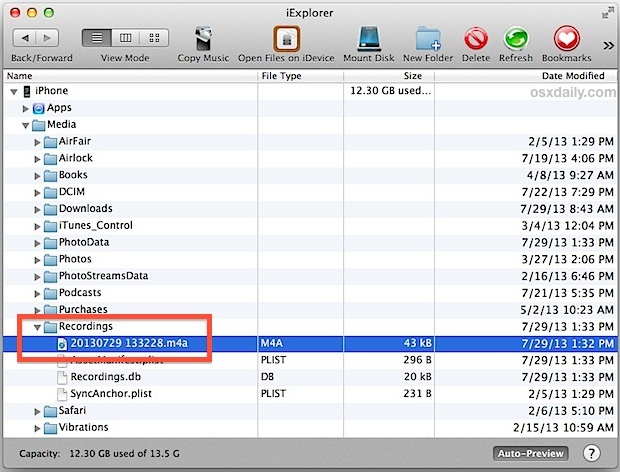 iExplorer is a free app for Mac OS X and Windows that lets you browse through any iOS device treating it kind of like an FTP server as if it had a normally accessible file system. This makes it possible to directly copy files from the iPhone, voice memos included, which is great if you’re looking to copy a large group of voice recordings over since you won’t run into any of the email attachment size limitations, or the repetition of tapping that “Share” button and filling up an inbox used with the prior approach. Obviously the downside to this approach is that you must use a third party application in addition to a USB cable, but the plus side is that it works without an internet connection, and it’s much faster for copying large quantities of voice recordings over to a computer. Regardless of which method you use, once you get the voice memo onto the computer you’ll find the files are actually stored as m4a audio documents, the same audio file format that many songs are stored in, and a simple file extension change away from converting a recording into a ringtone if you’re into that kind of thing. Easiest way, the one not listed, is just to sync them. Unlike songs, iTunes WILL sync voice memos both to, and from and iOS device. Help! Whenever I’m listening to a voice memo and need to stop and come back to it on my iPhone it Always goes back to the beginning instead of where I left off. Very frustrating! 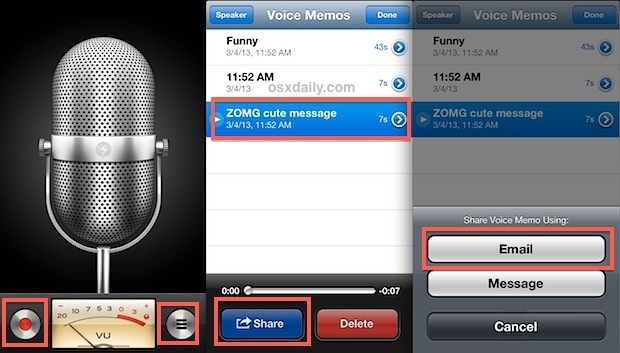 A voice memo is an audio message often used to remind someone of something. As our memory capacity is limited, it will be very useful to record important information by using voice memos. Voice memo gives you the option to email the memo, so you could email it to yourself and then save the voice memo attachments to your computer. 1. Plug your iPhone to iTunes. 2. Open iTunes on your computer and select your iPhone from the sidebar. 3. Click “Music” from the tab options from the different options given on the left of the screen. 4. Check “Sync Music” and then click the “Include voice memos” check box. This will extract your voice memos and load them into iTunes. 5. Now click “Apply” in the bottom right corner of iTunes. iTunes will then sync with your iPhone and download your voice memos to your computer. Another easier solution is iOS Transfer. Connect > select > transfer. How do you keep it from syncing in reverse, computer to iPhone? I have many saved lecture recordings that I have successfully synced to my iTunes, and then deleted from my phone. But the next time I hook it up to sync newer recordings to iTunes from phone, it works both ways and puts ALL of the recordings I have on iTunes back onto my phone and then I have to go through the process of manually deleting them all over again. Thanks.